Venezuela after Chavez: is the Bolivarian revolution under threat? The death of Hugo Chavez has led to a period of turmoil and uncertainty in Venezuela with the opposition backed by the Obama administration calling into question the legitimacy of elections won by his chosen successor, Nicolas Maduro, with the intention to destabilise the Bolivarian Revolution. 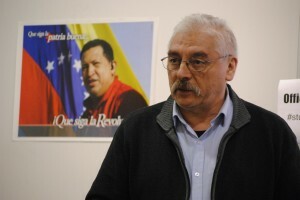 Francisco Dominguez is Head of the Centre for Brazilian and Latin American Studies at Middlesex University and Secretary of the Venezuelan Solidarity Campaign. He will look at the achievements of the Chavez era, the current political, social and economic situation in Venezuela and the future of the Bolivarian revolution at a time of great changes in Latin America.